What should Buckeye fans’ expectations be for the next 3-5 years under Ryan Day? 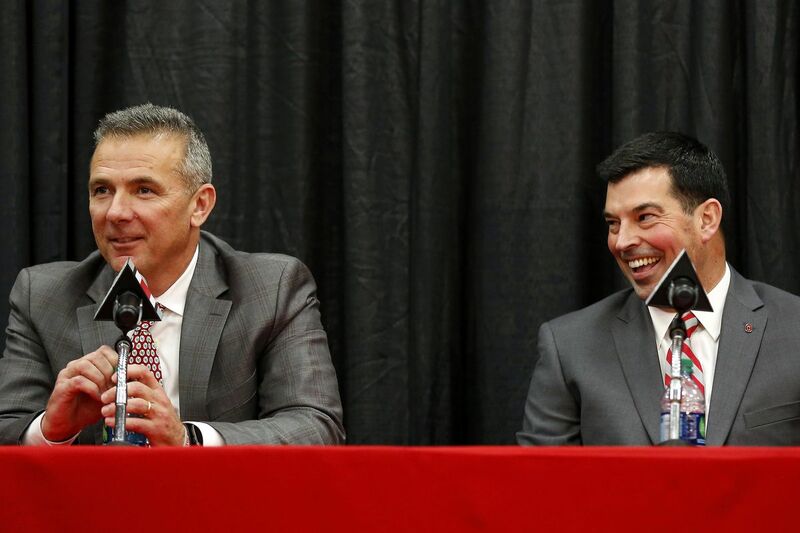 It’s been a week since Ohio State announced Urban Meyer’s retirement and Ryan Day as the next head coach. What are your expectations for Ryan Day’s first year? What would be considered success/failure? Geoff: I think the expectations for Day, unfortunately, are going to be graded way too harshly. Because he’s following in the footsteps of John Cooper, Jim Tressel and Urban Meyer, that’s three head coaches that are in/will be in the Hall of Fame. I think 9-3 would be a nice spot for win expectations for 2019. On a micro level, a better defense would be good, too. However, it’s a matter of time before defenses start adapting to a West Coast, pass-happy OSU offense—just like how teams began cracking the code on Meyer’s spread offense. Alexis: I’d consider a 9-win season a success, but expect him to continue beating Michigan every year and at least being in contention for the Big Ten East, if not to win it again. Dan H: My expectations for Ryan Day’s first year are not much lower than the ones I held entering this season. I still expect Ohio State to be one of the best teams in the Big Ten conference as well as one of the top teams in the country. I think a successful season would consist of a Big Ten title and a college football playoff selection. This is still Ohio State and Urban Meyer is leaving Ryan Day with a full cupboard. The biggest failure we could see this season, other than a losing record (which would be shocking) would be losing to our rival at Michigan. Max: Expectation: 10-2 with a New Year’s 6 bowl game. Success- anything above that especially playoffs+beating MI. Failure- 8 wins or less with loss to MI. Tony: Assuming Haskins leaves (I think he does leave), I expect a solid season from Ohio State but I don’t think they’ll be a playoff team. I think they can win the Big Ten but a loss or two in the regular season wouldn’t be surprising. A successful season will be the team showing signs of life with Ryan Day. I’m not going to put a number on wins or losses, because even at Ohio State, I won’t expect a new coach to go undefeated in year 1 every time like Urban did. The way the team presents itself, handles itself, and faces adversity will be important factors of success. A failure would be losing games in a bad way, not being able to recover and saying the wrong things post-game. Again, I don’t expect an undefeated season, but if it turns into a mess then it’ll be a failure in year one. Caleb: I believe Day’s first year will look similar to this past season. If Haskins returns, it could be exactly the same type of offensive year. However, if Tate is the new QB, I believe they’ll adjust to their players like he even said and still have a very good offensive team. On defense, I’d expect things to actually be better. Whether that means a new DC and strategy or even keeping Schinao, I can’t see Davis being back so I honestly believe changing an approach and ending up making things more simple will prove to help. A success would be another Big Ten title and a failure would be an 8-4 type of year with the talent he has coming back. Matt: For me, I think it is too early to tell what my expectations will be. I think that we will be able to make educated guesses by mid-January, once we know what Day’s coaching staff will look like, and what draft-eligible players will depart for the NFL. If we just assume all of those things are as equally good as they are bad, I would say a 9-3 regular season would be a safe assumption, with obviously the opportunity to improve a game or two (or three) each way. The schedule is not particularly difficult next year. Luke Fickell’s Cincinnati team is the highlight of the non-conference schedule. And while all three of their Big Ten West crossover games (Nebraska, Northwestern, Wisconsin) should be winnable, those are all teams that could upset Ohio State. The toughest portion of the schedule is obviously the last two games, as they have Senior Day against Penn State, and then go to Ann Arbor to finish the season. A pretty rough way to end the regular season for a first-time head coach. What will determine success, for me, it’s less about the record, and more about the transition and the consistency of how the team plays and the coaches coach. I think far too often this season we heard people brush aside substantive issues with comments like, “They’re 9-1, stop criticizing everything.” So, if the team is 7-3, but the on-field product is more consistent – but a few bounces didn’t go their way – I will be ok with that in the long-term. Chad: I’m slightly in the minority here, but my expectations are still really high for 2019. There should be far fewer off-field distractions. Day has a lot of opportunity to bring in new defensive coaching talent and shore up the 2018 team’s weaknesses. He at least has the potential to reinvigorate a team that could have been headed for a slight decline without coaching changes. But most importantly, expectations for 2019 should be high because the Buckeyes should still be one of the three most talented teams in the country. Overall: In the short term, most of the staff expects a little drop off from the 2018 season, which means 9 or 10 wins. Anything worse than a 9-win regular season record would be a disappointment, while a Big Ten Championship and playoff appearance could be on the table. What about in the next 3-5 years? Geoff: Wins/losses will be the immediate litmus test for success—especially against Michigan. In the next few years, it’ll be the recruiting classes that will be under the microscope. Urban has brought in fantastic class after fantastic class, and Day is expected to do the same. If he’s able to recruit heavily in-state, that buys him more time if he has a couple bad seasons. Alexis: Perhaps my Ohio State scarlet colored lenses have me a little too optimistic, but I do think that he can jump right in where Urban left off. I think we could continue being a one-loss (at most) program during his tenure. Dan H: Again, this is still Ohio State and the program will continue to be one of the elites in all of college football. Day showed earlier this season that he can coach and the players latched onto what he was preaching quickly and believed in him 100%. If that can transfer to the recruiting aspect, Ohio State will be just fine. Max: I think he’ll recruit well and make the playoffs in 2 or 3 if he doesn’t leave for the NFL. A losing record against MI will sink him. Tony: I have high expectations for Ryan Day, and I think he’ll become one of the better coaches in the country within 3-5 years. I think recruiting won’t come as easy to start but he’ll get there. The thought of competing for a national championship 3-5 years from now seems likely. I mean, it is still Ohio State. I’m sure Bama and Clemson will still be Bama and Clemson, but if Ohio State locks down recruiting in Ohio and pulls out gems from down south, in New Jersey, etc., they’ll be in great shape. Caleb: In the next 3-5 years I believe you’ll see Day’s program starting to be it’s own. I think only time will be able to make this program drift from Meyer’s ways, etc. Record wise, I’d expect him to have a staff much like Meyer’s that recruits well and develops well. I’m not sure if he will be “as” successful as a Meyer coached team, but I certainly think he has the potential and can do it. Matt: In three to five years, for Day to be a success, I think he has to have gotten to the College Football Playoff at least once or twice. I know it is virtually impossible to replace a legend, especially when you are a 39 yer old who’s never been a head coach before, but this is Ohio State. If you are in charge for half a decade and you don’t make the playoff, win a couple Big Ten titles, and go 4-1 against TTUN, it will be disappointing. Now, I don’t know if that makes it a failure, but it’s certainly not a success. While I have not been shy about criticizing Meyer and his coaching staff, I do think that it is important to remember that he is 81-9 at Ohio State. That kind of run is not likely to ever happen again. So, I think that to expect Day to match Meyer in on field success is dangerous. I think that he can be a very successful Ohio State coach and never match the dominance that Meyer had. But, should he be able to continue that run, I certainly won’t complain. Chad: In 3-5 years, I think 2 playoff appearances is a reasonable/achievable goal given the talent base he has to work with. Overall: In general, we expect Day’s Buckeyes to have pretty similar success as Meyer’s over the next 3-5 years. There’s every reason to think the Buckeyes can re-join the ranks of Alabama, Clemson, and Georgia as annual contenders. However, it’s also important to realize that Meyer’s overall record is insane, and it’s unfair to hold anyone to that standard. Was Ryan Day your first choice or would you have preferred a wider, more open search for a replacement? Geoff: In my book, he’s the only coach that feels right. I might be in the minority in thinking that Iowa State’s Matt Campbell would’ve been a colossal failure to launch if he came to OSU. There’s about 5 top-flight names in the college game right now (Nick Saban, Dabo Swinney, Jimbo Fisher, Urban and Chris Peterson), and OSU got lucky in getting one of them in 2012. I rather get an in-house hire than not, because you can keep the nucleus of football IQ around him—the coaches. Alexis: He was my first choice, and I’ve been excited about his potential since he joined the staff. It seemed like he was committed to the program -- buying his first house, versus renting in his 17 year coaching career -- and that Ohio State was in turn committed to Day. I think he brings a lot to the QB room, and will be able to usher in the new era of football at Ohio State. As the game evolves, the coaches need to as well, and Day’s youth in that capacity is a win, in my opinion. Dan H: Ryan Day was my first choice. Outside of Urban Meyer, Jim Tressel, Luke Fickell and John Cooper, Ryan Day is the only person on this planet with experience coaching an Ohio State football team, a job unlike all the rest in college football - and he is also undefeated in the role. While I expect the team to have some losses under Day, I can’t think of anyone else I would prefer over him that was a realistic option. Max: Second choice behind Matt Campbell. I like the hire and wanted to keep him regardless but of course very unproven. Tony: I wouldn’t have wanted any other coach to get this job other than Ryan Day. Not that others couldn’t do the job well, or even at an elite level, but Ryan Day just feels right. The search for a new coach didn’t have to be any larger than what it was, which is a testament to Day (or at least that’s how I see it). I’m totally satisfied with Ohio State’s process and the result of Day getting the job. Caleb: As a Meyer fan, I’m happy with this choice. Day is someone Meyer trusts and keeps things together. It would be tough to go national and have to basically re-start a program that isn’t fundamentally hurting. Regardless of what people think about Urban, he has an incredible program here that in my opinion didn’t need many changes. (aside from 1-2 assistant coaches). Matt: I am completely comfortable with Ryan Day succeeding Urban Meyer. Would I have preferred that he got the job in a more traditional way, with Gene Smith reaching out to some other coaches across the country? Probably. But, Day is a young, innovative coach, who has the potential to reshape the Ohio State program for the next two to three decades. Smith made a pretty lights out hire recently with Chris Holtmann, so I suppose I trust him with this one too. Chad: I remember being skeptical about the Lincoln Riley promotion at the time, but I was obviously very wrong about that. I’m very excited about Day’s hire. I’m interested to see how he motivates his team and manages his coaching staff, but I’m optimistic. There aren’t many other names I’d be interested in. Overall: Day was almost everyone’s top choice to replace Meyer, even though the athletic department didn’t make a big nation-wide search (although it sounds like Meyer thought through other potential replacements). Even though Ohio State is a top job and could have attracted more qualified candidates from a resume perspective, everyone feels good about the hire. What would be your first three changes if you were Ryan Day? Geoff: Solve the defensive struggles would be first. If that means switching around the personnel, then that’s what it will need to be. You can’t rely on 400-yard passing days to save you every week. Second, I’d recruit more in-state prospects. Specifically: Mr. Ohio cannot leave the state. Jackson Carmen was an absolute heist by Clemson, and the potential of Zach Harrison, a Central Ohio recruit, going to Michigan is downright criminal. Third, I’d try to be the de facto face of the OSU program. As long as he’s still with the University, Urban’s presence casts a shadow—similar to Barry Alvarez at Wisconsin. Day has to be the guy for this program. Honestly, I would try and be as open as possible with the media (e.g. give enlightening answers to questions) and have that transparency. Same goes with the student body, and fans in general; the more positive he appears as a public face, the more they’ll want him to stay in Columbus. While winning is everything in Columbus, you might be able to extend your time in Ohio’s capital city by being a likable character. Dan H: 1. Look at who you have as your supporting cast- the assistant coaches. Judge what you have accordingly and if you need to replace some with people you trust more, than do so. I don’t want to name any names as I never would wish for someone to lose their job, however Day needs people he can trust to help him lead this program if he is going to be successful. 2. Strengthen the focus on recruiting in-state. This is something Meyer spoke on every year, but it never came to fruition. Day has the opportunity to come in and make this a priority. 3. Run your offense. Who knows what this means in full, but I have a feeling the play calling looks slightly different this year and it will be a necessary change. Max: Fire Bill Davis, go to full Nickel with zone, fire Greg Schiano. Tony: Number 1, play the best players on the team. Urban became a little too loyal to certain players which I think held the team back. Chris Olave and Brendon White shouldn’t have had to wait so long to get playing time, for example. Number 2, hire a new defensive coordinator, unless Greg Schiano is committed to making big changes. Number 3, start a new tradition. It doesn’t have to be anything crazy, but to put a Ryan Day twist on the way things currently operate would be a good idea in my opinion. I think that would be a fun way to transition into the new era of Ohio State football. Caleb: 1. New LB coach/DC. Get someone with Ohio ties. Marcus Freeman if possible. Young, great mind and recruiter who played at OSU. 2. Have the new DC keep being aggressive, but change the sole focus on press-man play from the corner position. So many times the guys play the man and not the ball and this causes big plays to happen simply because guys aren’t looking for the ball. really would change how they “cover”. 3. Not sure how it’s changed, but an approach to certain games. Each season lately it feels like there’s that game or two that OSU either finally pulls it out with a win or they just get hammered by a team they shouldn’t get hammered by. Again, I don’t know how that’s changed or even addressed because of course winning every game is hard and not possible sometimes, but that’s as a fan something that is hard to get past. Matt: 1) Bye bye, Bill Davis. 2) Find a graduate transfer quarterback to compete with Tate Martell and Matthew Baldwin for the starting job. 3) Make sure that Greg Schiano or whomever is the defensive coordinator is next year is willing to play a defensive style more conducive to the talent on the team. Chad: 1. Reevaluate all defensive coaches — is the problem more at the coordinator or position coach level? Just prioritize fitting defensive scheme to available personnel. 2. Recruit like crazy — can’t afford to slide, since the standard is competing with Bama, Clemson, and Georgia. Even small dips in recruiting can come back to haunt the team in future years. 3. Make sure you beat UW in the Rose Bowl (even though Meyer will still be around) — a win could help build program momentum in 2019. Overall: The biggest changes are obvious — make some adjustments to the defensive coaching staff and schemes. You have to wonder: if Day can keep the offense going at a similar level as 2018 but make some improvements on defense, couldn’t Day’s 2019 season be as good or better than this season? Is Ohio State’s football program healthy? Geoff: Absolutely. The talent is there, the recruits are there (at least for 2019), and there’s a good amount of football knowledge on the staff. This isn’t like Florida after Meyer left, where you could make a case that the program was in a state-of-decay. I almost feel like I, who has zero playing or coaching experience, could take over the program tomorrow, and at least get three wins just off talent; in most places, that doesn’t happen. This program is in incredible shape, and Day has the keys to the castle. However, because it’s in such great shape, there’s an expectation to keep it that way. Alexis: I think overall, yes. Urban Meyer -- and Jim Tressel before him -- built a very solid foundation for this kind of transition. Day will have all the resources he needs, and is a guy who will keep the focus on the players. Day was really impressive in his early season press conferences, and I am looking forward to a different voice providing insights each week into the state of the team. He appears to be a genuine guy which will go a long way on the recruiting trail and will help build even more trust among the locker room -- plus, he doesn’t use a lot of “coach speak” which is appreciated on the media side of things. Max: Yes and no. The players are solid, recruiting is good, and still an incredibly good team. Some of the coaches don’t need to be here and that’s poisoned the well a bit, but overall I think healthy. Tony: Absolutely, yes. Ohio State’s football program is elite, healthy and who knows, it could get even better under Ryan Day. I’m very confident in his abilities. Caleb: Yes. I said it earlier, but regardless of what people think about Urban, he’s an incredible coach who built an awesome program. I’ve never seen a player graduated or current bad mouth him and those are the people even he said that matter most opinion wise. That to me sticks out and shows me he has built a program that cares and sets kids up for success beyond football. All of that shows health in a program. Matt: Definitely. I think that Day will bring some stability to recruiting, which has probably hurt the Buckeyes in this class. The negative recruiting has been real against Meyer, and while I’m not sure that his uncertain future has been the deciding factor for any recruits in recent years, I do think that it has factored in for a lot of top recruits. Does Day have the same cache as Meyer? Of course not, but he’s an exciting player – especially for offensive players – and there’s no question whether or not he’s going to retire in the next few years. Chad: I wouldn’t say the program is unhealthy at all — I mean, Ohio State did only lose one game this season and beat Michigan by a million — but the are/were early warning signs of some slippage: being non-competitive in their last playoff appearance, potentially missing the last two top Ohio recruits (although maybe the tide is turning with Zach Harrison? ), getting blown out by unranked teams in each of the last two seasons, and missing the playoff both years, too. It’s obviously unfair to hold Ohio State to an insane standard — but at the same time, we talked about the Buckeyes in the same league as Alabama (and above the rest of the “great” teams) not too long ago. Now I think the Buckeyes are just in the “great” tier of teams that could challenge for the championship — where Oklahoma and Notre Dame (and maybe Georgia) are right now. It’s a step down from where they were. Maintaining Ohio State’s position in that tier should be a goal, but it’s not unreasonable to think the Buckeyes could challenge for the very top tier again. Overall: The staff is optimistic about the state of the program — beyond a few coaching changes, there shouldn’t be many needed changes for Day in his first year. However, will the 2019 recruiting class — which is a solid step or two back from Meyer’s previous classes — be a blip or the start of a trend? Is the standard at Ohio State being in contention for the playoff or is it making the playoff nearly every year? So what do you think? What changes would you make if you were Day? Are optimistic about the football program moving forward? And what’s the standard for Ohio State — how many playoff appearances/Big Ten titles/etc. should fans reasonably expect? Column: Passing on Dwayne Haskins will be a mistake for any NFL team in need of a QB Smokescreen or not, the discourse around Dwayne Haskins needs to be reset. If Ohio State wants to win a title in 2019, they’ll need to be more than good. They’ll need to be lucky There’s no shame in admitting this. Buckeyes galore in the latest seven round mock draft It’ll be another great showing for Ohio State at this year’s NFL Draft. So, what exactly is Ohio State going to do with Matthew Baldwin in the transfer portal? The Buckeyes are without a backup quarterback. Luckily, they have some options.